Air Dough is now available online from airdoughmagic.co.uk and priced to sell. There is no point in it sitting in our warehouse when it could be better used on kitchen, dining room and any other kind of craft table around the country. Suitable for Children and Adults alike AirDough Modeling Clay is revolutionary in its capabilities. Roll it out thin and make delicate costume patterns or mould it up big for fantastic easy to create shapes and characters. The possibilities are endless and need to be explored. That’s why we hope you will submit your projects to us so we can showcase them in our up coming Air Dough Projects 2010 Competition (details to be announced in February). So in the meantime we look forward to your orders and please don’t hesitate to contact us for further information or advice. Air Dough for sale … nearly! We are nearly ready to sell Air Dough online – I know you are all waiting desperately! In the mean time if you would like to contact me directly I can arrange for you to get the Air Dough you need! Air Dough is made by New Clay Products. New Clay make high quality clay and dough products. They make the famous newplast that Aardman use to make the Wallace and Gromit characters and many more. It is recommended as the best for animation and far higher quailty than plastercine. Air Dough is a soft modelling dough that air dries to a strong slightly pliable finish. Once you have made something from Air Dough and let it dry you can colour it with pens or paints and even varnish it. 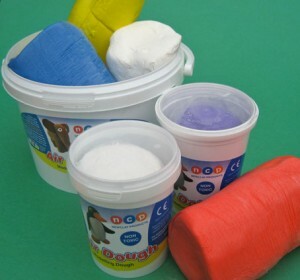 Air Dough comes in many colours and is available in different pot sizes. Air Dough is a really fun modeling dough. It is lightweight and non-toxic. It is so easy to use and mould and inviting to play with and it is air-drying. There are so many things you can do with air dough and it is suitable to such a wide age range (form 3 to 103+) that we have set up this site to share ideas and techniques to inspire our readers. If you would like to buy air dough through us please watch this space! !